SAO PAULO: Brazilian archeologists have discovered an ancient rock carving they say is at least 10,000 years old, making it the oldest human carving in the Americas. The claim, detailed in an article in the online scientific journal PLoS ONE, opens the controversial debate over when and how humans populated the Americas. The 30 centimeter (12 inches) carving is of a man with a "C" shaped head and three fingers per hand. 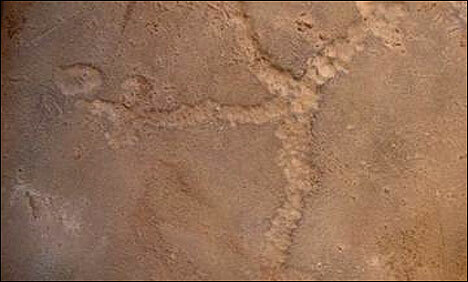 Walter Neves, an archeologist with the Universidad de Sao Paulo and a member of the team that made the discovery, said the rock carving, or petroglyph, could be part of a "cult of fertility." The ancient work of art was found in 2009 at Lagoa Santa, in central Brazil some 60 kilometers (35 miles) from Belo Horizonte, the capital of Minas Gerais state.